Formed in 2013, since its inception, the IGAD has grown in a community of practice strength to over 200 members, becoming one of the RDA’s most prominent Thematic Groups. IGAD is a domain-oriented group working on all issues related to global agriculture data, with the main objective to consolidate the RDA’s work in building social and technological bridges towards open data sharing. Through its five Working Groups (WGs) - Wheat Data Interoperability, Rice Data Interoperability, AgriSemantics, On-Farm Data Sharing and Capacity Development, - IGAD supports stakeholders in producing, aggregating, managing, consuming data for agricultural research and innovation. Join IGAD here for free and make your voice count within the international community! The IGAD RDA's 12th pre-meeting brought its participants into discussions around case-studies on Open Data collections taking into account that the establishment of in situ data sharing practices within research institutions in low/middle-income countries (LMIC) is vital for the development of the reusable Open Data landscape in the Global South (Global Bioethics, Volume 29, 2018 - Issue 1). Drawing on several examples, impacts and open issues on streamlining of data collections in Africa, IGAD sees opportunities to improve agriculture data community engagement, raise awareness and build capacity, all towards improving research through increased responsible data sharing and interoperability involving researchers in Africa and other LMICs. For example, the implementation/replication of the recommendations of the IGAD Wheat Data Interoperability WG have already proved to be a success in different agriculture communities of practice, forged new alliances, as well as created new offshoot groups aimed at specific data interoperability solutions at the international level. During the RDA Plenary sessions, IGAD has hosted a wide array of speakers and discussions and it continues to work alongside major international initiatives such as: FAO of the UN, GODAN, CGIAR, CTA, EMBRAPA, CAAS, INRA, CiMMYT, CODATA, NARIs/NARS, among other parties that are critical to IGAD’s success! If you are a technology specialist, researcher, librarian, farmer, journalist, communication officer… interested in commenting, contributing, advocating for IGAD initiatives… Join IGAD here for free and make your voice count within the international community! IGAD is looking forward to working with all in taking Open Agriculture Data forward along with key stakeholders globally. During the IGAD RDA's 12th pre-meeting, researchers, policy makers, practitioners discussed on the basis of several presentations of good practices and research projects about data usage, data collection and digitalization in relation to farmers and agriculture in Africa. * helps efficiently monitor, measure, and improve their impact. Even though open research and public open data are an essential fuel towards a digital transformation of agriculture, this is not the only component that triggers such transformation. To turn open data into effective decision-making services in agricultural sector, there is a need for creating an ecosystem of interactions between business (farmers, agribusiness, advisors, governments, innovation brokers, start-ups, investors, ICT developers...) and research entities. @IGAD RDA's 12th Plenary delegates: Thank you for being an important part of our community! * shared straightforward and low cost data collection methods. The importance of capacity development in this regard was highlighted in most of the discussions. Two parallel workshops held (for researchers and infomediaries) - hosted by IGAD together with GODAN Action and CTA. These workshops aim at sharing first-hand knowledge of the advantages of use of open data, open data impacts in agriculture & nutrition, as well as insights on applying research storylines to the new data management cycle. GODAN Action fosters several capacity development activities (e.g., free Open Data Management in Agriculture and Nutrition Online Course) to help current, new and potential stakeholders to fully understand the benefits of open data sharing for agriculture and nutrition and basically engage in open data. BENEFITS FROM THE DATA COLLECTION PROCESS & ITS REPLICATION … IN AFRICA! Based on Plan4all - Aggregation of large open datasets related to planning activities and SDI 4 APPS - Uptake of Open Geographic Information through innovative Services Based on Linked Data initiatives, the idea to extend Open Land Use map for Africa for different planning activities is based on available land use data on a local level (in selected countries) from various sources that can be combined at different levels of detail into a seamless map. As it is seen now, the land used in Africa is mostly defined by data (available to download) coming from Africover project (which has done land cover mapping in particular African countries), GHSL (Global Human Settlement Layer) dataset (from which areas of residential land use has been identified), OSM LanduseLancover. An important aspect is that data are available as open data, and the innovative aspect is that data are not only combined into a seamless database, but also used in crowdsourcing for data collection and update. Newly identified data sources will be integrated into the map. More details here. Distinguishing between 'personal data' and non-personal data/non-personally identifiable information (non-PII) is an important first step in determining the most appropriate policy, regulatory and practical approach to managing the opening of access to agricultural data in Africa. More details here. Even though nowadays Digital Innovation Hubs (DIH) provide services to the agricultural sector and ICT business (farmers, agribusiness, advisors, governments, innovation brokers, start-ups, investors, ICT developers...), DIHs also need to facilitate access to competence centers (universities, research and technology organizations, incubators) which offer access to various infrastructures and research platforms and open information (data, algorithms, models, thematic knowledge). The presentation focused on the formation of the digitalagriculture #DigitAg convergence laboratory in the French region of Occitania, and was an attempt to boost interaction and interdisciplinary work among various scientific laboratories engaged in digital agriculture research. #DigitAg has helped create new networking between two domains of digital and agricultural science, with mobilized elements of open science (open data, open source...). More details here. Even though Farmers’ organisations (FOs) and agribusiness companies are important players in providing services to farmers in Africa Caribbean Pacific (ACP) countries, they often face a limited performance of delivering better (precision agriculture data) services to support better decision-making based on adequate access, handling and sharing of aggregated data. * Capacity building on data management particularly focussed on shared data. Since Burkina Faso has a hydrologic network which is comparable to a funnel from which collected water is drained out of the territory, Burkina’s agriculture sector faces many of problems including degradation of natural resources, reduction of diversity of the ecosystems, just to name a few… Lack of the organization of agricultural actors to access to knowledge worsens the current situation. * Market information system to improve the income of the farmers. To fully understand the implications of varying factors within any cropping system, it is essential to combine results of field management practices with information on crop phenotypes. The use of ontologies with fieldbooks has proven to be a successful way to harmonize breeding data, such as with the Crop Ontology and Integrated Breeding Platform (IBP). Ontologies proffer further advantages for data mining and exploration, including the possibility for making inferences, and connecting with Linked Data in other related domains (e.g. nutrition and health). AgroFIMS: (Agronomy Field Information Management System) consists of a web application displaying variables that are concepts in the Agronomy Ontology, relevant crop ontologies, and other related ontologies. These variables are sorted into a series of modules representing the typical cycle of operations in agronomic trial management, such as land preparation, irrigation, weeding, soil fertility, weather and soil parameters, biotic and abiotic stress observation and control, among others. AgroFIMS aims to reduce error and ease data collection via an in-development mobile app that will allow digital data collection in the field; it is also possible to adapt AgroFIMS to other digital data collection platforms such as Open Data Kit (ODK). An AgroFIMS prototype was subject to user testing by agronomists, in September 2018, and garnered interest and enthusiasm. Early adopters will use a first release, in 2019, for field-testing to capture data during the 2019 cropping season. The Global Dataverse Community Consortium (GDCC), initiated and represented by members of the IQSS at Harvard University, the Odum Institute for Research in Social Science in the US and by DANS in the Netherlands, promoted the creation of an international melting pot where many interactions at global level are conceptualized. The hosts discussed the current African context including potential use cases as well as an imaginable support infrastructure concept for research data management with Open source research data repository software Dataverse. A selected showcase will demonstrate how the International Maize and Wheat improvement Center (CIMMYT), which is part of the GDCC, utilizes and promotes Dataverse in the international agricultural research area. Thanks to the global partnership network of CIMMYT, including its offices in several African countries, the use of Dataverse has been expanded. It was implemented in collaboration with another research organization in Africa. This could be a use case for adoption not only in the African, but in the global context as well. CIMMYT work in Africa and additional informative material. * How will that data be used or shared? * What about data protection? What do we mean by the farmers’ rights to data? * What is the state of recognition of these rights at a national and international level? * What’s the role of GDPR in the agricultural sector? There is a big need today to address these issues correctly and quickly to ensure farmers’ rights properly. At the RDA9 IGAD Pre-meeting in Barcelona, a strong interest was shown in developing a working group (WG) to look for synergies in capacity development in agricultural research and its potential contribution to the realization of the Sustainable Development Goals. As a result, the IGAD Capacity Development WG was formed and endorsed by the Research Data Alliance (RDA), in August 2018. The aim of this WG is to develop synergies between existing education and training activities and agricultural science needs by performing a landscape assessment to identify existing gaps and training requirements within the Interest Group on Agricultural Data (IGAD) WGs and related groups. Particular focus will be placed on sharing knowledge about training initiatives and technologies, reducing digital divides so that researchers and practitioners in developing countries can benefit. The WG will also empower the existing collaboration among IGAD, GODAN and GODAN Action. More details here. THANKS to our host – the UNIVERSITY OF BOTSWANA – and main organisers Committee on Data of the International Council for Science (CODATA), Research Data Alliance (RDA), World Data System (WDS), and ALL DELEGATES, for an excellent event, fruitful discussions and inspiration provided of the frontier issues of data in research! 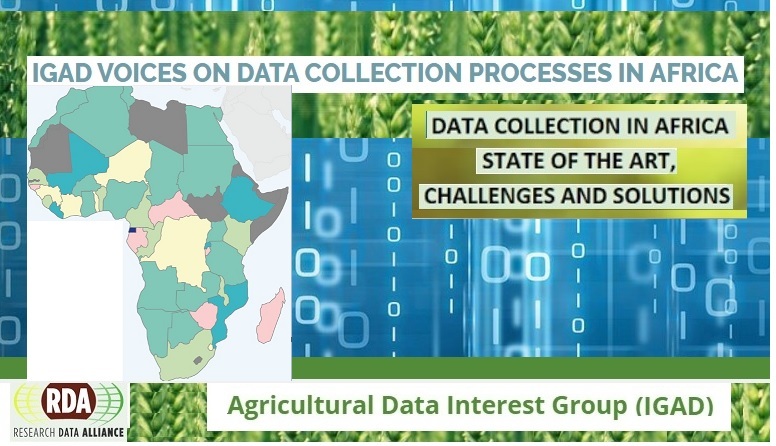 We hope you will use RDA IGAD initiatives for innovative ways to collect, manage and re-use high quality (research) open data… since many challenges still lie ahead for the different stakeholders across agriculture value chains and data ecosystems. If you are interested in all IGAD presentations, please visit the F1000Research Open Knowledge in Agricultural Development (OKAD) channel. IGAD will organize and chair the next RDA IGAD meeting on 2-4 April 2019, in Philadelphia (Pennsylvania, USA), involving stakeholders from over world, with an increased participation from North America. Details on the 13th Plenary meeting. IGAD attendees also participated in side RDA Plenary events aimed at accelerating actions needed to speed up together ‘The Digital Frontiers of Global Science’, in terms of adoption of RDA outputs & recommendations and identifying opportunities to scale-up new RDA successful actions, catalyse cross-sectoral learning and enhance North-South cooperation! The 12th RDA Plenary was attended by over 820 participants from 64 countries and 6 continents, with top numbers from Africa (60%) and the United States. The 12th RDA Plenary Meeting and SciDataCon2018 (#SciDataCon) were combined in the framework of the International Data Week2018 (#IDW2018) that explored how data can transform agriculture, education, health, contribute to social inclusion and preservation of global heritage, the environment and biodiversity. In this context, participants examined the policy dimensions of Open Science and the technical implementation that enables data to be findable, accessible, interoperable and reusable (FAIR) to be managed using trusted platforms (more details: National Research Education Networks NRENs in Africa). African research and innovation will require investment in capacity development to advance innovative data skills and thus to take better advantage of data in agriculture and nutrition. This requires coordinated strategies and policies on data curation, access and analysis, the implementation of infrastructures and technologies for data stewardship, and engagement with promotion to all stakeholders - public, private and civil society - on of the benefits of open approaches to research. Join RDA IGAD here for free! We can definitely learn so much from each other and promote it together! For more updates follow @AIMS_Community on Twitter... And, thanks again for your interest!